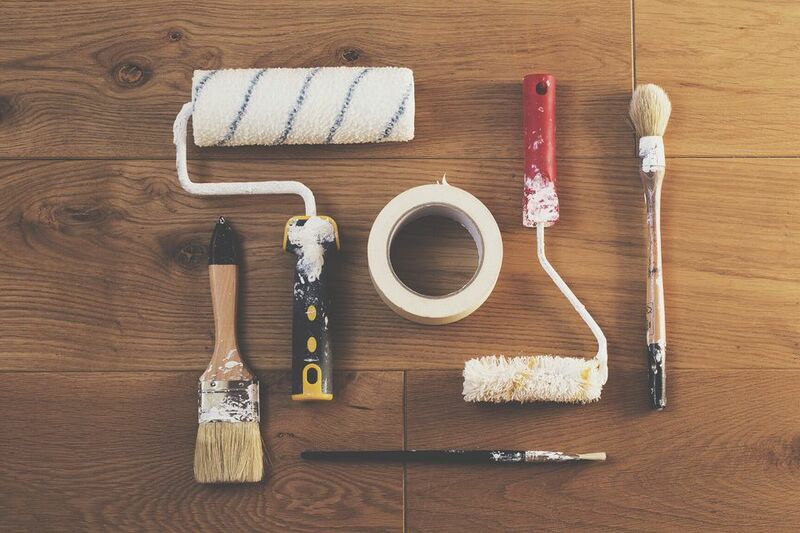 This list of essential, can't-live-without-them supplies for house painting is rather subjective, but there are paint supplies included here that many resisted for a long time and eventually gravitated to due to genuine need. Do you need to purchase every single item here before applying roller to wall? No, but they would certainly make your life easier. Painting the interior of wood windows is a pain in the you-know-what. We cannot think of a less pleasant job than painting all of that trim and mullions and framing, but one thing that really helps is a sash brush. Call it what you may—sash brush, tapered brush—but this brush was positively born for the highly exacting process of painting windows. The tapered end of the sash brush helps you get in those tight and narrow corners between the paintable surface and the non-paintable surface. Invest a few dollars in a good tapered or angled brush to make your window-painting go much cleaner and smoother. A paint brush comb is one of those funny little devices whose utility far exceeds its cost. Cleaning a ​paintbrush well is essential to extending the life of the brush. A poorly cleaned brush will gunk up with paint after just a few uses, sending your nice, expensive sash brush straight to the trash. A paintbrush comb helps you open up the bristles as you run water or solvent over them, further loosening and removing paint. It's not dropcloth; it's called masking film for a reason. That's because it's a very thin plastic sheet that clings to surfaces via static electricity. Professional painters use masking film to drape off windows, doors, cabinets, walls, and just about anything else that will not be painted. If you care to spend a bit more, get pre-taped masking film. It comes with a strip of painter's tape already applied to one edge. One prominent example of pre-taped masking film is Tape & Drape. Don't even think about walking on plastic dropcloths (unless your health insurance is paid up). Even when dry, plastic dropcloths present a significant slip-hazard. A canvas drop cloth is definitely an investment in your future DIY painting career: prepare to spend at least $20 for a decent 10 oz. canvas drop cloth (dropcloths are represented in ounces per square yard; thus a 10 oz. dropcloth weights ten ounces per square yard). Paint color samples are an essential tool in choosing your eventual paint color. Paint chips, color cards, and online visualizers come nowhere close to the color fidelity of samples. Paint color samples are the real color, but not the real paint. Blue painter's tape is like normal masking tape with less stick-ability. You want the tape the stick less when you are removing it; otherwise, you may be left with scraps that linger forever. Blue painter's tape is rated by how many days you can leave it in place before its adhesive does begin to harden and become difficult to remove. Blue painter's tape is expensive, so use it sparingly. One brand-name you will encounter is Scotch-Blue™. Some paint sprayers, like the Wagner Electric, are fairly anemic. Others, like the Graco TrueCoat Pro Cordless Airless Sprayer, give you decent return for your money. Then you've got some unusual ones, like Ryobi Duet Power Paint System FPR300, sprayer-roller that draws straight from the paint can (no more pouring!). In years past, you couldn't find a decent consumer-level sprayer anywhere. Now it's a matter of winnowing down the options to find the right one for your job. With its chemical name, it sounds scary and exotic. TSP is just a powder you can buy at any hardware store and even grocery stores as an all-purpose cleaning agent. It's cheap and safer to use than the name implies. If you hate the idea of mixing powder with water, you can buy premixed TSP. Interior walls ​don't always need to be cleaned with TSP, despite what paint manufacturers recommend. If you're encountering grease and hard-to-remove grime, then TSP is indispensable, though.